Also watch Barry Schwartz about Abundance on TEDtalks and the negative effect of choice. Ben Cook’s fingers flurried so fast you couldn’t see what he was doing until he had done it. But when the cell-phone screens cleared, the world’s fastest text messenger was handed his first head-to-head defeat Tuesday: a voice-recognition computer had bested his record time on a complicated 27-word message. A “Tower of Babel” device that gives the illusion of being bilingual is being developed by US scientists. Users simply have to silently mouth a word in their own language for it to be translated and read out in another. The researchers said the effect was like watching a television programme that had been dubbed. A great article on the development and drivers of social networks at Gigaom. I see a huge opportunity for operators to jump on this wagon. It makes a point for object(photo, video) oriented social networks to get a critical base(get them on it) and then start to involve the users a valuable asset in the value chain through communications. Some inspriring stuff on the Telco 2.0 blog. 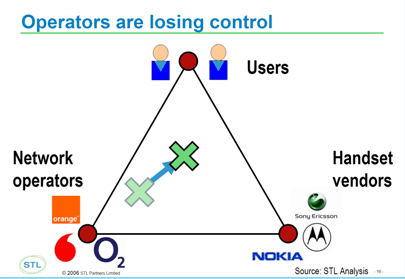 It tells about the shifting of control between handset vendors, operators and users. Conclusion: the user gains control. The question I have is what impact does the increasing power of the user have for both the handset vendor and the operator. Seems to me that when your traditional control weakens your brand will be a key asset!! Sounds pretty healthy to me..It will be preference and cost which will drive the decision. So efficient and high quality distribution of communication services and an appealing brand. Here comes the problem. Do the big global operators have appealing brands? I don’t think so. They have to reach a broad audience with many messages. I believe that we will see segmented and targetted brands. Coming from MVNO’s?? This is user generated content!!!! Great.. Very inspirational and shows what you can do with videoblogging and Google Maps API. These guys are hitchhiking to all 50 state capitals in 50 days or less. Their position will be updated on a Google Map every 15 seconds, as well as geocoded photos, podcasts and videos. The cool thing about this project is that it’s all built using off-the-shelf technology – in particular a $50 GPS enabled phone. Drop by and offer them a ride..
Well must say it works pretty good. Too bad my text which was in my MMS is gone..
Posted straight from my phone with Nakama. Click to see more. More and more I have the idea that the movements of social networks can be compared to the weather. They change due to some constant changing forces.. The three main forces that, I believe, change social networks are: size, feeling of community and relevance. These forces are constantly moving. For example MySpace: its is so big that people feel lost again and miss the community/family feeling resulting in less relevance. Youth are the first to leave. YouTube/Flickr? Same thing happens. They start to be so big that I am starting to get lost.. Feeling that I am missing out on the good stuff(real stuff). From a technological and marketing point of view working with tags should help me guide right? NOT! Also the provision of other content with the same tag around your selected photo/clip doesn’t work. It gives me the feeling that I always need to search.. The focus is on the search not on the experience. I am never satisfied in my true need: feeling connected share experiences and be entertained. You know as around a campfire. I am not satisfied with leaving just a comment. Next to that these big social sophisticated smart databases are to clinical in the end to really entertain me. Where is the Ben & Jerry’s in these networks. The human aspect? Surprise me sometimes. Simple things like Google does during special days(christmas, Halloween). Without a ‘human’ face it will be hard to build a brand and loyalty. It is such a difficult balance between size(enough relevant content), community feeling( feeling connected) and relevance(understanding the TRUE needs). Only way to have lasting social networks I believe is that Instant Messaging and Social Media merge. Giving you the objects to share and the people to share it with..